I never expected my blog, Deliciously Ella, to grow into the community it is now. As many of you know, my journey started back in 2011 after I was diagnosed with an illness called Postural Tachycardia Syndrome. It had a pretty devastating effect on my life, both mentally and physically. I started reading all I could find about the link between diet and lifestyle, and the way they can help manage illnesses. I was incredibly inspired by what I was learning and decided to change my life by adopting a whole-foods, plant-based diet and removing most processed foods from my meals. Slowly but surely, I began to regain control of my symptoms. It took me about two years, but eventually I came off my medication, and I’ve been working on stabilizing the condition ever since. I have recurrences every now and again, but I’m now able to live the life that I want to and no longer feel held back by this chronic illness. It’s been a challenging but incredibly empowering process. I never thought I’d be a businesswoman or an entrepreneur, but over the last few years my husband, Matthew, and I have spent all of our waking time creating a company in London that is passionate about natural food, the environment and social responsibility. Our passion is to change the conversation and perception around natural food. Deliciously Ella has always served two purposes—inspiring me to learn to cook and giving me a positive outlet, both of which hugely helped me to become the person I am today. Sharing what I was learning was my way of turning a negative into a positive and it’s been truly amazing to see so many people enjoy the recipes. More than anything I’ve wanted to use this space to show how easy it is to create beautiful, nourishing and, most important, delicious meals from simple, natural ingredients. As the community grew, so did my following in the United States—a country I count as one of my major sources of inspiration. I spent a few months living in Venice Beach in 2014 and was incredibly energized by the food scene there. It’s influenced so much of what Matt and I have done so far—with our delis in London, with the cookbooks and the app—and I’m really excited to start spending more time in the US and to get to know you all! Over the last few years healthy eating has really grown in popularity, which has been wonderful to watch! It’s given me such a thrill to see people realize how good they feel when they eat foods that nourish their bodies. The best part of it all, though, is that everyone’s started to see how incredibly delicious healthy living can be. The stereotype that it’s all about lettuce and cucumber is vanishing and is being replaced with dreamy visions of blueberry pancake stacks with caramelized banana bites and crunchy cacao and almond butter, bowls of creamy sweet potato noodles with satay sauce, mango and mushroom ceviche and chocolate orange tart. So many of my readers say that they love eating whole foods and incorporating plant-based meals into their routine . . . but that their husbands, wives, children, friends and colleagues are more skeptical and, as a result, they’re not particularly open-minded about trying new, veggie-laden dishes. Lots of people also struggle to know what to cook and how to put menus together when they’re entertaining, especially when they’re new to this way of eating. When I first started eating a plant-based diet, I found it hard to know which dishes would complement each other best. I got it really wrong a few times with my friends and I’m pretty sure they left the table thinking I was a bit mad! The good news is that this book is designed to solve both these issues. Each chapter is focused on delicious meals. I’ve got your mornings covered with brunches and breakfasts, followed by lighter meals that work well on the go; big healthy feasts and celebration menus; essential side dishes, party staples and, of course, everyone’s favorite—desserts. I’ve also given meal suggestions that cater to your every sociable need: think brunch for the girls, or a grab-and-go breakfast, pantry saviors, delights for your desk, cold-weather comforters, Mexican fiestas and even dishes—such as a knockout Sunday lunch—designed to impress the skeptics in your life! So once you’ve worked your way through the book you’ll feel inspired, knowing exactly how to put Deliciously Ella–style meals together in a way that persuades your friends and family to try some healthy versions of their favorites. Plus, you’ll get to cook more than one hundred delicious new recipes. We’ll be making so many lovely things, from peanut butter and jelly cake to quesadillas stuffed with garlicky beans, cashew sour cream, salsa and guacamole; almond butter rocky roads; pea, zucchini and coconut risotto; chickpea chili with baked sweet potatoes; and chocolate peanut butter pie! Get ready: this is a seriously tasty book. We’ll start with my favorite breakfast and brunch recipes: think on-the-go menus with crumbly blueberry squares, roasted almond butter bars and honey and lemon breakfast bars. Or awesome savory brunches with stacks of sweet potato rösti piled high with maple and rosemary butter beans and spread with a thick layer of herby guacamole. We’re also having toasted buckwheat and coconut granola with zesty mango and pineapple bowls and passion fruit yogurt, as well as baked garlicky tomatoes, scrambled turmeric and red pepper tofu and thyme fried mushrooms. There’s a great range of options, from easy dishes you can throw together to help rushed mornings when you’re time poor, to fancy brunches to share on lazy weekends. We’ll then go through some fantastic lighter recipes that work well for quick weekday suppers, as well as portable lunches. We’ll look at fresh bites like mango and mushroom ceviche and sushi rolls filled with cauliflower rice, sesame and avocado; after-work catch-up menus of spiced potato cakes with garlicky tomato sauce and green beans; and perfect picnics with charred coconut corn and vibrant salads filled with mango, pepper, cucumber and a peanut dressing. This chapter is full of my go-to meals, quick and easy, but still so delicious! The chile and ginger pho, sesame slaw, pistachio and apricot quinoa and sesame and maple summer rolls are real favorites here. I make these for Matt and me during the week when we’re at home, or when I have a couple of girlfriends coming over for weekday supper. The next chapter is all about hearty feasts and celebrations. These are the meals I make when I have lots of friends and family over, or want to impress someone! I promise all these dishes and menus will convince any skeptic that eating well can be pretty amazing. There’s a great selection of ideas in here, from Mexican-themed feasts, to curries with homemade lime pickle, to warming meals of tomato and eggplant bake served alongside bowls of spinach with mustard seeds. We then cover everything from garden parties filled with charred cauliflower steaks on a bed of chile quinoa and sun-dried tomato and butter bean hummus, to comforting bowls of three-bean stew with mango salsa, to simple, inexpensive suppers of spiced chickpea chili stuffed into baked sweet potatoes. There’s really something for everyone. After this we move toward side dishes. This is probably my favorite chapter of the book as there’s such a wide range of ingredients, flavors and textures here. I absolutely love using these as traditional sides, but it’s also fun to make a few of these recipes and throw them into a bowl together to make a full meal. It always looks beautiful and tastes sensational. 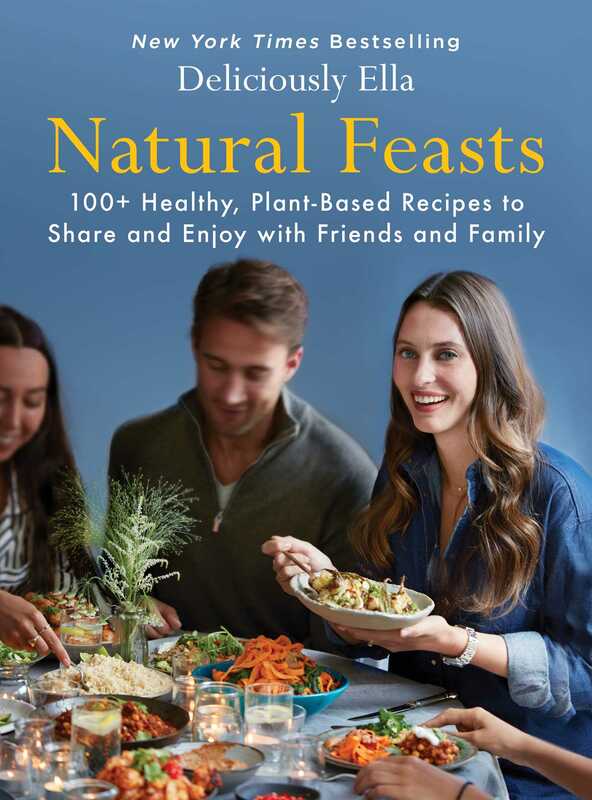 I have so many much-loved recipes in this chapter, but the baked plantains with a sweet chile sauce, the smashed potatoes with turmeric and mustard seeds, the miso and sesame glazed eggplants and the spicy baked avocado fries with their lime, cashew and cilantro dip are all absolute winners . . . and you all should try them. I have a feeling that they’ll become staples in your diet too. There’s a good mix of impressive and simple dishes in this chapter, so there should be something to suit every taste bud and every occasion. The other great thing about the recipes in this chapter is that you can mix and match them with just about anything, so if you’re not ready to go fully Deliciously Ella, then just add these to your existing go-to meals. That way you can experiment with new ingredients without it all feeling too new and overwhelming. If you’re a meat eater, then these are great ways to incorporate a bit more plant-based goodness into your diet too, and hopefully they’ll get you excited about how good veggies can taste. To make things more fun I’ve dedicated a whole chapter to parties; we’ve got nibbles, cocktails and mocktails and even birthday teas! You’ll be able to serve a lovely array of little bites, from charred Padrón peppers with chipotle cream to bowls of smoky baked tortilla chips with babaganoush, eggplant rolls with a minty coconut tzatziki and mini baked potatoes with cashew sour cream and chives, as well as mini socca pizza bites. To accompany them there’s a list of mocktails and cocktails, so you and your friends can sip on sparkling pineapple and cayenne drinks, or watermelon and cucumber coolers as you catch up. And to end the chapter we’ve got a beautiful afternoon tea with iced ginger muffins, a banana and raisin cake and simple cucumber and lemon butter bean hummus open sandwiches, as well as a birthday tea with peanut butter and honey oat bars, blueberry scones with vanilla coconut cream and a triple-layered celebration cake. I think this chapter will really show your friends and family that healthy eating is accessible, delicious and sociable—it’s absolutely not about sitting on your own at home every night meditating and eating kale salad! These dishes are amazing if you want to do a big dinner party, too, as they mean you can keep it delicious but with a healthy twist from start to finish! To end the book we’ll go through all the best sweet ways to finish a meal. I know how much my readers love sweets and there are some real winners in this chapter, which I’m sure you’ll all really enjoying making, eating and sharing (if there’s any left by the time your friends arrive!). We’ve got beautiful desserts like pistachio and orange truffles, watermelon and mint granita, pan-fried cardamom and honey apples and berries with creamy chocolate sauce and crushed nuts, which work so well as lighter options at the end of a meal. There are also lots of amazing snacks, from salted maca and tahini fudge, to orange and cardamom cookies and my personal favorite—quinoa, hazelnut and cacao bars—that work really well on the go. Then, if you’re looking for something heartier and more indulgent, there are some wonders for you near the end of the chapter as we move toward chocolate peanut butter pie, glazed orange polenta cake and even a sticky toffee pudding. There’s so much here for everyone, and I’m sure these will all go over really well with your friends and family. Hopefully the recipes, ideas and menus that you’ll see throughout the book will inspire you to get cooking, so that you can enjoy amazing food with the people you love. Of course, you don’t have to use the book in this way; I pull out single recipes and make them on their own all the time, as they’re all so great and obviously you won’t necessarily want to make a full three-course meal every night! I’ve just put them together to help you work out what goes well with what, so that you feel confident in the kitchen. While I am on the subject of sharing food with others, including those who might be more skeptical about eating plant-based food, the other point I’d like to highlight is that eating well is not about labels, guilt or enforcing a certain way of eating on yourself or anyone else. It’s so important to remember this, especially when you’re introducing your friends and family to this kind of food, as you don’t want them to feel too overwhelmed and daunted by the concept. The way we eat is so personal to us, and we are all different. We have different bodies, different medical histories, different genes, different lifestyles and different tastes. I do believe that everyone is better off—both physically and mentally—with a diet full of fruit, veg, nuts, seeds, beans, legumes, healthy grains, and less refined sugar and processed food . . . but, after that, you have to make your own decisions, and it’s OK if these are different from the choices made by your friends and family. Only you know what’s practical, enjoyable and sustainable for your lifestyle and, as with anything in life, the way you eat doesn’t fall into a one-size-fits-all bucket. Healthy eating is about finding a way of eating that makes you happy. It’s about meals that make you feel your best—that might mean a crumbly blueberry square for breakfast, a lemony potato and butter bean salad for lunch . . . and then a pizza with wine for dinner with friends—and that’s totally OK. It’s your body and your life. Yes, I want to encourage everyone to show their bodies some love and take good care of them, but I never ever want anyone to feel guilty because they’re not eating “perfectly” all the time. Plus, there is no such thing as perfect—perfect is simply finding a balance that is right for you, whatever that is. This book is all about natural, plant-based food and the recipes are all vegetarian and wheat-free, but there are no labels on any of it. It’s simply about delicious food that’s designed to help you feel good, and you can adapt any of it. As you read this book, please don’t feel you have to put yourself firmly into any dietary “category.” Putting yourself in a certain box with a specific label can be quite restrictive. You just shouldn’t feel that you’re not healthy if you’re not specifically raw, plant-based, Paleo, grain-free, gluten-free, wheat-free or any of the rest of it. You can absolutely be a bit of everything, you just have to be honest with yourself and work out what makes you feel best . . . and that might be a happy mix of everything. Of course it can also mean following a certain concept, but please don’t feel as though it’s wrong if you don’t. Likewise, you shouldn’t expect anyone else you know and love to categorize themselves either. Don’t forget that healthy eating should never be prescriptive or restricting! The other thing to note is that we also all want to commit to healthy eating to different extents and that’s great. I eat the way I do because I love it, but also because it’s the only way that I’m able to manage my illness. I want to—and have to—eat nourishing food all the time. Just because I eat this way every day, though, doesn’t mean you should feel bad if you don’t. Similarly, you shouldn’t inflict guilt on anyone else if they’re not ready to eat healthily all day long either, just focus on encouraging them to add more natural foods to their diet and celebrate the small steps and changes that they’re making rather than focusing on the other things you feel they could be doing. We all respond so much better to positivity than negativity. So please remember that when you’re introducing friends and family to this food, it’s important to let them know that it’s totally OK to be a flexible healthy eater and that—just because you live with someone or spend a lot of time together—it doesn’t mean you have to eat in exactly the same way. Everyone has to start somewhere, at some point, and it’s much better to introduce healthy living to your own or someone else’s life in a sustainable way over time than it is to do it all at once . . . and then quit three days later because you/they hate living on kale salads. Find a balance that works for you and the people around you, incorporate whole ingredients and nourishing foods whenever you can and—most important—please don’t beat yourself up or make anyone else feel bad for eating something that isn’t super healthy . . . because life is much too short for that! If you’re having a real skeptic for dinner, or trying to get an unconvinced family member to try a healthier meal, then always cook something that looks and feels familiar to them. Choose a classic dish that has a healthy spin on it. Something like quesadillas and cashew sour cream and guacamole. This is a perfect meal, as your guests are never going to look at it and think, “What is that, it looks terrifyingly healthy!” and decide they don’t like it before they try it, plus it’s really satisfying and hearty, which means everyone will go home full. So remember to go easy on everyone, don’t leap straight to raw food, or anything too unfamiliar and scary looking! No one likes to be preached at or made to feel guilty about anything in life, especially the way they eat, as it’s often attached to a lot of emotions and possibly deep-rooted insecurities. Don’t talk about meals as being “good” or “bad” healthwise: there’s no point categorizing anything to inflict guilt. Instead just demonstrate how delicious healthy food is. Make your friends amazing, nourishing meals and encourage them to try them, but without telling them why it’s so much better than what they normally eat. Simply cook and share natural goodness; that’s exactly how I got all my friends and family involved. If you do want to inspire them with the benefits of healthy eating, then let them know how good you’ve been feeling since you started incorporating more whole foods into your diet, and how much your own energy levels—and everything else—have improved . . . but just don’t go on about it too much! As I said earlier, healthy eating isn’t about labeling yourself or forcing yourself to do something you don’t enjoy. If you’re new to healthy eating, or trying to get friends and family involved, don’t be afraid to adapt any of my recipes to make them more accessible for your audience. If adding chicken, fish, cheese or eggs makes the people you love more likely to try something new, then add them in by all means; if it makes them more receptive and allows them to enjoy the meal more, then that’s a great thing. It also means their plate will look more familiar, which I find is the best approach. You don’t have to overhaul your diet overnight. There’s no rush or deadline for changing your lifestyle. It’s about finding an enjoyable, sustainable way of life that makes you happy and it really doesn’t matter how long it takes to get there! Start by focusing on positives and adding goodness in, rather than taking everything away. Add in new veggie dishes throughout the week, but don’t feel you have to remove the old favorites at the same time; just let the two coexist for a while as you get used to new ways of eating and cooking. Allow yourself and the people around you however long you and they need to start loving the new ingredients, textures and tastes. Most important, never criticize yourself if you don’t enjoy something! You don’t have to love all fruit and veg; even I don’t enjoy them all—you’ll never find me eating iceberg lettuce or green peppers for example—but that’s OK, there are so many other lovely ingredients out there to experiment with instead. It’s so important to remember that no one is perfect, and there’s no point in striving for perfection, as the concept simply doesn’t exist. This is relevant to everything in life really, but I believe it’s especially important to remember when thinking about food. When it comes to what we eat and how we eat, we just have to do what makes us feel happiest and never forget that this will be different for everyone. Food is such an important part of life and you don’t want to feel stressed every time you sit down for a meal, which takes away all the fun from something you should really look forward to and savor. So find a balance that you enjoy and, if you lapse from your healthy-eating plan, never beat yourself up, just find a positive way to get back into it; we’re all only human after all! Every change in life also takes time to become a habit, so don’t expect yourself to wake up craving quinoa on day one; sadly it’s unlikely to happen. Just be OK with that, accept where you are right now and, crucially, don’t judge what you are craving: embrace it . . . and then try to incorporate a healthy something on the side! Concentrate on making the food you serve look really appetizing. It may sound like a bit of a waste of time, but it’s not. We eat with our eyes first, so a dish needs to look tempting, especially if you’re trying to get someone new excited about it. If you and your guests think it looks amazing, you’ll all be much more open-minded and ready for it to taste amazing, too. This has been one of the most important things for me as Deliciously Ella, especially on the blog and Instagram. So many readers have said that they tried something they thought they wouldn’t like because it looked great, and they ended up loving it! It doesn’t take long to enhance the appearance of something. You just need to put it in a clean, beautiful serving dish (rather than serving it in what you cooked it in) and then add a little color and texture with dressings, herb sprinklings and toppings such as toasted nuts and pomegranates. This may sound a bit strange, but I find it really helps people be more objective if they don’t know there’s a certain ingredient in a dish. Lots of us think we hate a particular taste or texture, but if we try it in a new context, we often end up loving it. I’ve had so many friends say, “Oh I hate dates,” but then they love my crunchy almond butter rocky roads and eat three of them, or they say they hate cilantro but adore the spiced potato cakes. Especially if it’s just one of many ingredients, it’s worth keeping it a secret so that they try it with an open mind . . . and I think you’ll both be surprised by the result! (Obviously, make sure you know they are not allergic to it first.) If it is a main ingredient, and therefore not disguisable, then I always highlight the fact that it’s been cooked in a totally different way and is being served with new flavors, to demonstrate that it’s very different from how they may have had it before, and this often works too. Just do your best to encourage your friends and family to try things with an open mind and you may end up with a few new converts! I hope my experiences, and the tips I’ve learned for convincing friends and family to try new things, are helpful to you all. Now, let’s get cooking!